IntelHost is a leading Brazilian Website Hosting Company founded in 2010 with the aspiration of providing best in class hosting services. IntelHost is based in Sao Paulo, Brazil and their mission is to go by the following three cornerstones of quality, service, and support. They are continually evolving their offering to keep up with the fast-paced developments in technology. They provide shared hosting, cloud hosting, fast servers, VPS and dedicated servers as well as colocation services. They provide hosting for all levels of business, from freelance developers to large Fortune 500 companies. IntelHost say that they are proud of the individual attention that they give to all size of customer accounts, from individuals to large corporations. IntelHost has their own onsite data center where they own all of their own servers and equipment. Therefore they are on hand to proactively manage and protect their infrastructure due to the fact that they don’t have to rely on any third party providers. IntelHost provides quality web hosting for a wide range of customers both in Brazil and beyond. They have some good quality, cost-effective web hosting that provides a great access point for smaller projects. For smaller CMS websites like Joomla and WordPress IntelHost provides optimized hosting for these types of website. 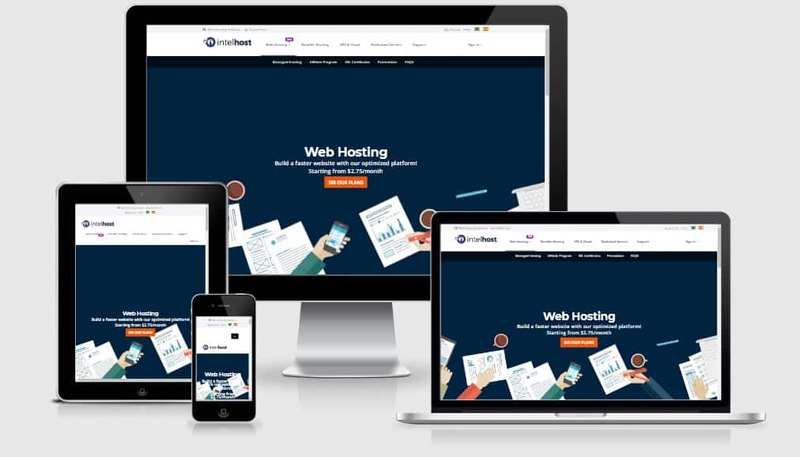 For those who have VPS or dedicated servers with IntelHost, they offer cPanel, the leading control panel for website administration. This provides clients with an easy to use Control Panel, to administer web accounts. Hosting packages available on IntelHost include Web Hosting, WordPress Hosting, Joomla Hosting, VPS Hosting, Reseller Hosting, Master Reseller Hosting and Dedicated Servers. The master reseller hosting allows customers to work directly with their own clients, whereby customers can provide their own hosting, and even create their own hosting company with the IntelHost Master Reseller offering. With this offering, customers can set and create their own packages and specifications. IntelHost provides 24/7 customer support and has live online customer support available to provide extensive technical expertise to their customer base whenever needed. They are committed to delivering top class security, reliability, and technical expertise to each customer. They offer various ways to get the much needed technical information over to their clients, from their extensive and helpful knowledgebase and faqs to opening a support ticket. You can also speak with them online via their live chat features on their website, where their qualified technicians will be willing to help with any updates, installations or technical issues that you may be experiencing. One great feature of IntelHost is that they have a dedicated in-house support desk, so they don’t outsource their support team. Therefore you can get directly in touch with them if you require urgent support. IntelHost has a great track record with 99.9% uptime, they say this is because they own world-class data center facilities. They have a feature rich, redundant power and network for maximum reliability. No matter what time of the day or night it is, IntelHost has onsite technical engineers ready and working 24 hours a day, every single day of the year. Therefore if a problem occurs, you have peace of mind that they have a team of experts available to respond immediately, and get to work resolving the issue straight away. This is another reason that they can state that they have such a great uptime because they are always there to tend to the data center if any issue should arise. ULTIMATE PACKAGE – The ultimate package offers unlimited hosting, unlimited space SSD, and unlimited bandwidth. Dedicated AMD 1 – Atom AMD Opteron™ Octa-Core, RAM 16 GB DDR3 ECC, HDD 2 x 2.000 GB SATA II and 100 Mbit/s. VPS1 – With 1 Core CPU, 1 GB RAM, 25 GB HD and 1 TB bandwidth. VPS2 – With 1 Core CPU, 2 GB RAM, 50 GB HD and 2 TB bandwidth. VPS3 – With 1 Core CPU, 2 GB RAM, 75 GB HD and 3 TB bandwidth. VPS4 – With 2 Cores CPU, 3 GB RAM, 100 GB HD and 4 TB bandwidth. VPS5 – With 2 Cores CPU, 5 GB RAM, 125 GB HD and 5 TB bandwidth. VPS6 – With 3 Cores CPU, 6 GB RAM, 150 GB HD, and 6 TB bandwidth. IntelHost is an experienced web host with a wide variety of offerings. Their website is easy to navigate and there is a feeling that you will get exactly what you need for hosting in Brazil and surrounding areas. I would certainly check them out if looking for a web host in Brazil, no matter what size of solution that is required. Their customer support is great, with around the clock access via live chat and a responsive ticketing system. A great all-round web hosting service with their own data centers and experienced support team.